Free Cash Flow Review Is Regal Wealth Scam? Adfaze Review – Time Waster? If you have been following HowToStaySafeOnTheNet.com, you will know for sure that PTC websites are usually, generally time wasters. Some of them are straight up non-value systems designed to part you and your cash, while a few are known to actually provide some form of value. Within this Adfaze Review, you will be provided with the right information that you need to know if this Adfaze PTC website will be of good value to you or if it is a system that you should just ignore. Before proceeding any further, you should take a look at a substantial way of using the same internet that you now have to create a longstanding business online – which will not just generate massive income, but also has the potential to allow you to have your own online business starting today. What Is Adfaze All About? Adfaze is essentially a PTC website. What is a PTC website you may ask? Well, a PTC (Paid To Click) website is a website where you usually signup for free and then is able to click on certain ads – viewing them to earn money. I have personally joined PTC websites (ClixSense and Traffic Monsoon) in the past but did not earn any substantial amount of money. When you join the Adfaze website, you can earn up to $0.01 per click. Members are also rewarded when they complete offers which are advertised on the website usually by other website owners. As an example: I could advertise my website on the Adfaze PTC network for a fee and anyone who clicks on my website link will be redirected to my website. This will potentially allow my website to gather more traffic, therefore increasing my overall site ranking, visitors, and essentially revenue. Website owners are those who profit more from the major PTC websites out there on the market. You may need to consider owning your own website if you plan on earning your first income online. How Do You Get Paid With AdFaze? AdFaze functions like most of the other PTC websites which you may or may not know about. Once you have managed to click around a few thousand times on the website viewing ads or completing hundreds of offers, you are then paid out once you have reached the required payout threshold. This usually takes a very long time to achieve and you will have found out that you have wasted countless hours and energy to make $5 bucks. Users are paid out via PayPal or Payza. These platforms are legitimate and known in the industry so no need to be worried about signing up to these legitimate platforms. How Much Can You Earn With AdFaze? According to the Adfaze FAQ page, you will be able to earn up to $1898.00 with their Ultimate membership. The Ultimate membership is the highest membership available. The other memberships are Standard and Golden. If you take a look below, you will see the breakdown of the Ultimate membership. For a full look at the FAQ page, click here for more details. By far, the best way that you can maximize the earning potential of any PTC website is by first having a website, writing a legit review about the website – AdFaze Website (similar to this one). Getting your affiliate link from the PTC company which you joined, then placing your affiliate link in texts and images within the actual review. This way you will be able to generate leads which will convert to people signing up under your affiliate link once they have visited your website. This will allow you to earn commissions from everyone who has joined the particular PTC company which you are affiliated with, provided that those people who you refer are taking some form of action. The beauty about this? You do not necessarily need to be there for someone to sign up as your referral. You could be in your bed sleeping while someone else on the other side of the world is clicking around on your website. That is why it is important that whatever product or service you offer to the public, it actually contains real value. No sense in promoting something which is a pure junk. No one will appreciate it and you will most certainly lose in the long run if that is your motive. I have read other reviews on the AdFaze PTC system and have found out that there are some people voicing their feedback on the system. I have mostly seen people saying that it is a scam that we all should stay from. Why do these people say this? Well, they have experienced the system and have worked their butts off without seeing any benefit. One particular comment I saw from a member is that he was not able to get his payments after he had upgraded to the Golden Membership. This is after he had to spend his money to buy 200 referrals just to earn $13. Yes, you will be able to buy referrals once you are inside the system if it is something you would be interested in. PTC websites have been around for a very long time and have paid out millions of dollars to their members. AdFaze is a newbie as it relates to PTC websites, so, in my opinion, they are a risk to take a shot at. I would personally recommend that you stick to a more established PTC company that has been on the scene for a longer time. I have already mentioned the more established ones (ClixSense and Traffic Monsoon) above, so those are the ones which I would endorse and give the thumbs up to. If you are ill bent in joining the Adfaze system, you are always free to do so. The only thing that I would say is that you will be wasting a whole lot of time with hopeful clicks. A better idea is to join them with the intention of solely getting your affiliate link, then doing as I have suggested above. It could also be beneficial if you are planning on advertising your website to gain traffic. Making money online is certainly possible and there is a whole lot to be made all over the internet. The best way is to sell your own product or better yet: promote someone else’s product and take a nice cut from the sale once someone purchases. If you would like some more information on how to do this effectively, you should be clicking here right now to find out how to do so. I believe you will do very well because I kinda sense that you want to give this making money online “thing” a go. If at anytime you need some help or would like me to clarify something that I have written here, I would be more than happy to provide you with the best answer possible. Looking forward to seeing you succeed online in this multi-trillion dollar industry. Take a slice of the pie! This AdFaze Review was written by Jason and submitted to the search engines on May 30, 2016. 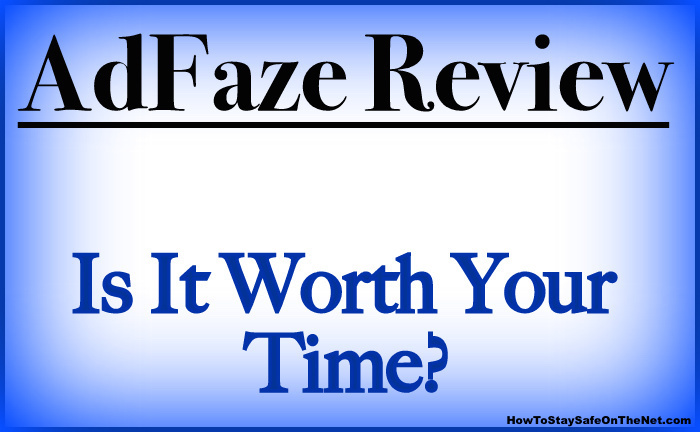 2 Responses to Adfaze Review – Time Waster? Thanks for sharing such a great review. I totally 100% agree with you, PTC sites are a complete waste of time, the effort you spent on clicking ads, it’s not worth the few bucks you are getting in return. Most PTC sites now survive using the “referral” system and it’s often a scam. They make use of the Pyramid Scheme model to recruit people into their business which is fraudulent and unethical. The only legit PTC in my opinion, is Clixsense, although it’s a waste of time too. Glad you see my point, Samuel. Even though most of the PTC sites are time wasters, they are still proof to anyone out there that it is really possible to use the internet to earn money. With that being said, I am NOT going to be wasting my time and efforts to click around when there are way better ways to spend my time making money online.